Now considered one of the visionary figures of the Romantic Age, William Blake (1757 - 1827) was relatively unknown during his lifetime. He excelled in the visual and literary arts where he practiced as a poet and print maker and engraver. Apparently he set the standard for being the most politically active poet, both in England and America, the likes of which weren't seen again until the emergence of Ezra Pound, over 150 years later. It would be wrong to say that he worked in obscurity, he was well know to contemporary artists, art critics and those that followed the arts. While he was an excellent engraver, his seven year apprenticeship to James Basire was in a style of line-engraving that was considered dated and old-fashioned. This probably made it difficult for him to not only find work but also to gain a following as public interest was more interested in new styles and techniques. Like other artistic visionaries, Blake broke free of the boundaries of his time, making it difficult for him to be understood by his contemporaries. Because he was not easily classified and often held what others considered to be somewhat incongruent ideas, some of his contemporaries even considered him mad. 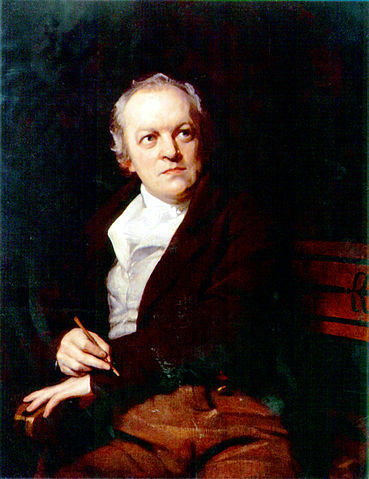 The portrait of William Blake was painted in 1807 by Thomas Phillips.